The time of hibernation is ending across North America, and we at SCI Foundation are excited to share a few updates from projects on which we have been busy gathering the best-available science on some of the continent’s most iconic species. The rut may have ended for elk and moose, but what we’ve learned during the winter has brought us more appreciation than ever for their place in nature. “Moose hold an endearing place in our hearts and out imagination, from Rocky’s side-kick Bullwinkle to Thidwick the moose from Dr. Seuss.” – Mike Gurnett, Montana Fish Wildlife and Parks. Montana moose have an endearing place in our hearts at SCI Foundation. Not only have we learned the truth behind their perceived decline, we’ve also learned how important hunter participation is. Montana Fish, Wildlife, & Parks (MTFWP) is now halfway through this 10-year study designed to examine the status of moose, improve the approaches in place, and maximize hunter harvest. So far, this study has proven to be the most cost-effective means to investigate moose populations by engaging the hunter/conservationist spirit in all of us. Just to recap, this study is taking place in three different areas of Montana; the Cabinet Mountains, the Rocky Mountain Front, and the Big Hole Valley. At the moment, only female moose are being collared and monitored for survival rates, fecundity, and calf survival. Other characteristics being monitored include age, rump fat, and tick loads. Of the females collared, the most common cause of mortality is health-related reasons, followed by predation by bears and wolves. Arterial worm is claiming more female moose than all other factors combined. However, despite this threat, female moose are still surviving to produce offspring and contribute to the modest growth in population observed in two of the three study sites. As this study continues, MTFWP and SCI Foundation will keep working to improve the current population estimation approaches while engaging local hunters and stakeholders. Hunters willing to submit blood samples from harvested moose, rump fat measurements, and even days they chose to hunt have yielded truly invaluable material. This information has been gathered from moose, elk, and deer hunters alike either in person or via telephone survey. Keep in mind, participation is entirely voluntary, making this one of the most collaborative state-wide efforts in the nation. The massive 2.5 million-acre Gunnison Basin is estimated to have a, “carrying capacity” of elk that is too low. Before the start of this project, that would’ve been enough information to seriously limit hunting and other activities in the area, especially with regards to elk. To perform a positive habitat treatment to assist elk numbers over such a large area would be far too expensive and time-consuming. Officially called the, “Expansion of Spatial and Temporal Monitoring of Elk Movements in the Gunnison Basin,” this project intends to address the fact that what we don’t know about elk hurts both humans and wildlife. Colorado Parks and Wildlife, the U.S. Forest Service, Bureau of Land Management, the Rocky Mountain Elk Foundation, with the support of SCI Foundation have spent the winter mapping elk occupancy patterns. Also called, “heat maps,” this new tool has begun to tell researchers and wildlife managers where elk spend most of their time in the Gunnison Basin. So far, we’ve learned that elk avoid major highways during the summer but not during the winter, spend the fall and mid-winter in open habitats, and frequent aspens in the spring. Studying the 90 GPS-collared elk has also taught researchers how the elk move throughout the fall, prompting a change in the number of hunting licenses being allocated. Already this project is yielding changes that are benefitting both wildlife managers and hunters alike. While knowing where elk are moving and the maximum harvest is extremely important, another more immediate result is where to expect them on local roadways. By partnering with the West Slope Wildlife Prioritization Study (WSWPS) and the Colorado Department of Transportation, the data from this project will identify which road segments have the highest crossing potential. When combined with other ungulate studies in the state, Colorado roads with the highest crossing potential will be identified to make roadways safer for both humans and wildlife. Photo courtesy of ScienceMag.org on January 25, 2018. 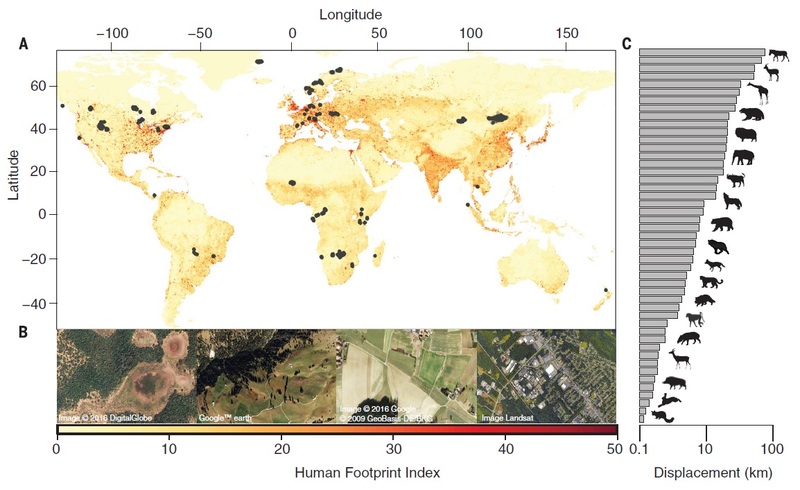 GPS relocations of 803 individuals across 57 species plotted on the global map of the Human Footprint Index (HFI) spanning from 0 (low; yellow) to 50 (high; red). A full analysis of data gathered from GPS locations is underway as you read these words. SCI Foundation has been proud to support this project since 2013 and we will continue to lend our help. The Alberta Ya Ha Tinda elk study was featured in a Science Magazine study published recently that took into account GPS data from 803 individual animals from 57 species on six continents. This data was compared with the human footprint index to create a big-picture conclusion regarding animal migrations across the globe. It was pointed out that elk in Alberta were no longer migrating to the Bow Valley, causing a change in the entire ecosystem. It won’t be long until wildlife managers across the continent are able to make the most well-informed wildlife management decisions possible. As data continues to flow in from the research being conducted in the field, we are gaining an understanding of just how valuable hunting is as a conservation tool. We at SCI Foundation are proud to be a part of projects that have the potential to change the narrative on wildlife conservation in North America. Stay tuned as we share more updates from projects that remained busy during the colder half of the year!